In this study, individual tree-biomass equations are developed for the different biomass components (foliage, branch, bark, stem, and total aboveground biomass) of Quercus frainetto Ten., Quercus cerris L., and Quercus petraea (Matt.) Liebl. species, which are the main oak species in coppice-originated oak forests. 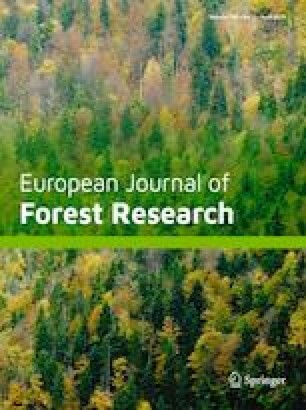 This research was conducted in northern Turkish Thrace, an important coppice-oak area. A total of 474 oak trees at different development stages over different sites were destructively sampled to obtain biomass models of the major oak species in the region. Two main biomass models are established to estimate the biomass components: according to the diameter at breast height (DBH) alone and according to the d2h variable, which is the combined DBH and tree height. The goodness-of-fit statistics of the models are calculated to compare these models. The models that use the DBH alone as an independent variable explain 68–95% of the variation in the biomass of the tree components. After adding the tree height to the model, the accuracy for the bark-, stem-, and total aboveground-biomass estimates increased, while the accuracy of the foliage- and branch-biomass estimates decreased. Different oak species have different biomass components depending on their development stages. The amount of biomass components in the total aboveground biomass and foliage decreased from 20% (SDF) to 4% (LDF), the amount of bark decreased from 17% (SDF) to 12% (LDF), and the amount of stems increased from 42% (SDF) to 66% (LDF) when increasing the mean DBH of the sample plots. The present study was financed by TUBITAK Project Number TOVAG-107O750. This work was supported by Istanbul University Research Projects Coordination Unit Project Number BEK-2016-21771. The authors thank two anonymous reviewers and editor for valuable comments and recommendations which significantly improved the original manuscript.